21 74550-2689 - 7/16 Round/axle Bushing (black). 40 73233-2279 - Taillight Lens Set. 43 0801-0224 - 8 X 1inch Screw. 32 73233-9339 - Headlight/guard Assembly. 39 73233-2759 - Taillight Housing Set. 57 73233-2439 - Key Assembly. 59 73233-2779 - Windshield Hinge Set . 48 74440-2059 - Kc Light Rack . 23 76817-4229 - Steering Linkage . 25 73233-2539 - Front Post Bushing . 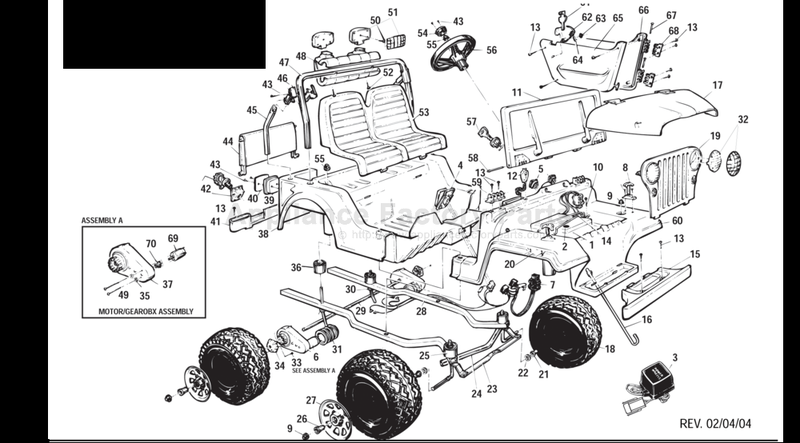 46 73233-2179 - Roll-bar Bracket Set. 36 73233-2549 - Rear Bushing . 42 73233-9249 - Gas Cap/flange Assembly. 47 74450-9219 - Sport Bar. 13 0801-0202 - (1) # 8 X 1/2 Screw.